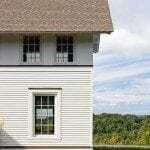 Do you have white replacement windows? An old house that has replacement windows is considered a damaged house to those of us in the historic preservation field. Maybe the evil previous homeowner committed this crime and you are left to deal with it. Don’t worry though, there are options to save the curb appeal of your house at least a little. Replacement windows are bad for many reasons. The sales people are super trained and have all the stats to show that their windows are what you need and it is virtually impossible to say no – trust me. Replacement windows are bad for the environment and a foolish investment. Their design is very bad -they look cheap, especially when they are white. 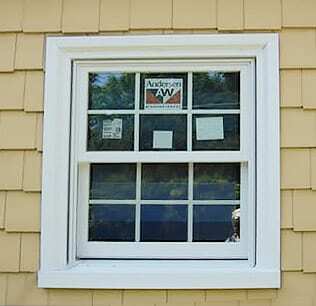 Go here for more information on wood windows versus replacement windows . The good news is that these replacement windows will only last 20 years! 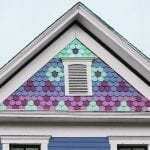 You can replace them with a wood window that can be painted to coordinate with your house colors. A typical cheap looking white replacement window with matching white trim and tan body color. Be careful when using white on your house! An all white house is good or a house that is half white (for instance white trim and a colored body) is also good. White paint is fine when you have a balance of white to another color. If your house is painted green and your trim is painted white, that’s a good balance because they are the most dominant colors on the house. If your house is one color and the trim is another color, having white just on the window sash in such a small dose will stand out like a sore thumb and look out of place on the house. The small amount of white paint will attract your attention first and prevent you from experiencing how the other colors work together. So if you want an all white house – that works. If you want a colored body and white trim, that works too, although other trim colors will look better. Avoid small doses of white on your windows or gutters at all costs! If you have a Victorian house, you should never have a white window sash. 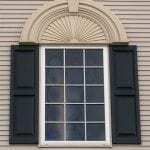 Your window sash should be a dark color such as black, dark green, dark red, or brown. The windows are the eyes of the house. When this most important feature is painted a dark color, it helps them recede and harmonize with the rest of the house. It’s like putting eyeliner on eyes. The window sash can make or break your house. See some before and after photos of how the window sashes can improve curb appeal . 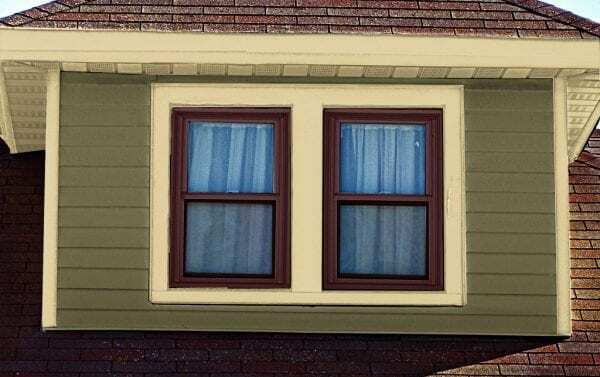 Painting the window sash a dark color is not only historically correct but makes the windows pop and enhance the other colors. The image above is a painted replacement window. The window sash for a replacement window also contains an extra trim making the replacement unit wider. When painted, the window appears bigger and heavier. Painting the sash only appears too thin. Just another problem all replacement windows have that you will need to accept. 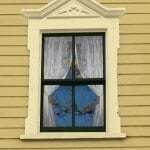 Read more information about how to paint a window sash on a wood and replacement window . Lots of people get this wrong. If you have a Colonial Revival house or a newer 20th century house, your house should have a light window sash that matches the trim. Trim matches window sash. This is good for Colonial Revivals and most 20th century homes. I rarely recommend white windows or white trim for a house unless it is all white or the body is a very pale color. White trim on a colored body looks like a vinyl-sided split-level home. White trim is what you see on just about every house and it looks cheap these days since it is associated with vinyl sided homes. This looks like every other house – white trim again – how interesting. The body color looks too dark against the harsh white which looks like plastic. Color placement is correct however. If your window sash cannot be painted then the trim must match the window. Not the best solution but this is how it must be. If your house has white replacement windows they can and should be painted. Any paint on vinyl will void the warranty. However, even if you do nothing you will find there will be some excuse to void the manufacturer’s warranty. If you are painting your vinyl replacement window a dark color, you must use a paint designed for vinyl. This paint is available everywhere and has reflective properties in it to prevent warping. If you are painting your white replacement window a light color like tan, just use regular house paint. If your replacement window has those tacky fake grills that are supposed to fool the simple minded into thinking the grills are muntins , and they are installed in between the glass, there is nothing you can do. You are stuck with these ugly white replacement windows until it’s time to replace them. Don’t even think of painting the window and leaving the grill white. Since you are now stuck with a white window sash, the color of the trim on your house must be white to match. The trim on a house is everything that is not siding. The trim is the window casing/frame, the soffit, the porch railing, etc. This all must be white otherwise the white replacement window will jump out and just shout “cheap plastic”. As I said before, I try to discourage the use of white trim and white windows on a historic house. White windows and trim may be my last choice but it works and will look good. Just not as good as it should look. 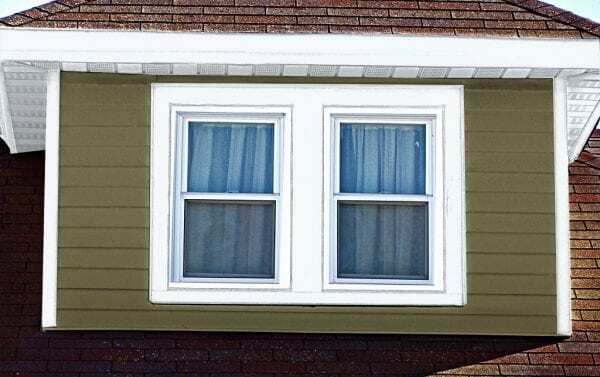 Substituting a white trim for a cream colored trim with a white replacement window will NOT look any better than a darker trim. It will still look very bad. You will still see the unfortunate difference as in the example below. DO NOT DO THIS. If the window sash is the only element that is white your house will look tacky. The trim must match the white replacement window. So if you have white replacement windows that you cannot paint you must paint all your trim white to match for the best appearance. Do not do what you see in the above photo. Both Anderson and Marvin windows sell white replacement windows. The color of their white windows is not bright white but more of a gray although it still reads white. The replacement window color is Sherwin Williams Frosty White 6196. The trim on your house should be painted this color. First you must verify this with a 6196 swatch from the paint store. Since this is basically an unappealing white, I have modified this color to look slightly better than, but not be noticeably different from the white replacement window from 10 feet away. Your eyes should see the two colors and your mind should interpret them as one. If this doesn’t work, let me know. With replacement windows, the trim is noticed more since it covers a larger area. We want the trim to be a real nice white with depth while looking the same as the replacement window. This is a nice, slightly warmer white compared to the cooler white replacement window. In case you were wondering, I’m not including an image here because most monitors cannot show such a small difference in the colors. Try these paint colors out and let me know what you think. Remember you do NOT want to see a difference between the window and trim colors from about 10 or so feet away. Hi, Unfortunately, my old house has only a few original windows (the POs kept the ones they thought were “fancy”). Surprisingly, they used bronze-colored metal replacement windows, so they are slim, but the color is not ridiculous. Well, except in the bathrooms and kitchen where the interior finish is white vinyl (who knew you could combine the two materials into one window). Do you have any suggestions for paint type or painting techniques for painting vinyl windows? I have used plain old latex indoors without mixed success—its fine on the outermost parts of the sashes, but where they “scrape” past one another it scratches off. I have dark green window sashes and storm windows. I recently replaced two storm windows but the cost was a real lot more for this green for only two windows. I therefore ordered black aluminum windows and painted them dark green. With the black you won’t see if I missed a spot. For white plastic windows go to Benjamin Moore or Sherwin Williams and say you want X color in paint for vinyl. Yes – paint the parts that do not touch. The problem is if you have white windows and paint them black you will have a difficult time covering all the white on the jamb. This may be noticed unfortunately.